Martini recipes are everywhere and they come in an infinite variety of flavors. Yet, it's important to understand that there is the Martini and then there are martinis. Quite often, the latter has little or no resemblance to the original other than the serving glass. The classic Gin Martini - made of gin and dry vermouth - will always remain a classic and a favorite for many drinkers. There is much debate among connoisseurs as to the ratio, style of gin (or vodka), and garnish that is the best. And yet, most will agree that the gin-vermouth combination is one of the best cocktails ever created. Some, like the Manhattan and Rob Roy, are as timeless as their gin cousin. Other, far more modern cocktail recipes mix everything from apples to chocolate and coffee to hot peppers into the little 'tinis. The list of what are now popularly known as 'martinis' has grown at a rapid pace and there are few signs of it slowing down. The martini has evolved into a style of drink. This collection of recipes celebrates that evolution and should help you navigate all of the options available. The classics that vary slightly from the liquor-vermouth combination. The newer drinks that have taken on the martini name. The popular martini bar drinks like the Cosmopolitan. The classic Gin Martini has been tweaked many times over the years and these recipes include the gentlest of improvisations. These drinks are the perfect excuse to pull out your favorite bottle of premium gin. Why? Because a great Martini begins with a great gin. In this list of cocktail recipes, you will find gin-based martinis that often rely on vermouth. There are a few exceptions which opt for a similar, lightly flavored modifier, though all are considered close cousins of the original. Also, many of these recipes are considered classics. They were created -- to the best of our knowledge -- sometime before Prohibition. Because of this, they're extremely easy to mix up as classic drinks are known for their simplicity. You will also find that many of these cocktails have that signature dry flavor profile found in the original. They are a nice change from the often sweetened martinis developed in more recent years. Some cocktails are naturally more popular than others and if you're going to start somewhere, these gin martinis are the perfect place. Martini - The classic Gin Martini and Dry Martini. 50-50 Martini - Equal parts gin and dry vermouth. Dirty Martini - Just add a splash of olive juice. Gibson - Hold the olives and garnish with a cocktail onion instead. Martinez - Use sweet vermouth and add maraschino liqueur. ​Perfect Martini - Pour both sweet and dry vermouths. Once you check each of those recipes off your list, give these martinis a try. In most instances, you will simply switch out or add an ingredient or two and a brand new cocktail is born. Imperial - Add a dash of maraschino liqueur. In & Out Martini - Rinse the glass with dry vermouth. Pink Gin - Hold the vermouth and keep the bitters. Rose - Add cherry brandy or Kirsch. Saketini - Replace the vermouth with sake. Smoky Martini - Hold the vermouth and rinse with scotch. Vesper Martini - James Bond's favorite of gin and vodka with a brand name vermouth. There are a few common terms used to describe martinis. You will notice these as you browse recipes and can use them to tell a bartender exactly how you want your drink. Vermouth is a key ingredient in many classic cocktails. The fortified wine is essential for any well-stocked bar and can be paired with a variety of distilled spirits. Any of these cocktails can rival the taste and esteem of the original Martini. The majority of the following cocktails are also considered classics. They mimic the Gin Martini formula, relying on either dry or sweet vermouth. The primary difference is that the gin is replaced with another distilled spirit such as whiskey or vodka. This small collection of recipes is where vermouth's versatility really begins to shine. Here, we skip the gin and use a different base spirit and each of these cocktails is essential to anyone's fancy drink repertoire. Irish Martini - A Vodka Martini with an Irish whiskey rinse. Manhattan - Rye whiskey (or the whiskey of your choice) and sweet vermouth. Perfect Manhattan - 'Perfect' with bourbon or another whiskey. Rob Roy - Scotch and sweet vermouth, also called a Scotch Manhattan. Tequini - Tequila and dry vermouth. Vodka Martini - Vodka and dry vermouth. If you want to continue your exploration of great martini cocktails, be sure to run through this list of recipes. A quick switch, a new ingredient for your bar, or a small addition is all they require. They're simple, fun, and delicious. Adonis - 'Perfect' with a dry sherry base. Affinity - 'Perfect' with Scotch whisky. Chrysanthemum - A touch of absinthe in a brandy 'martini'. Bamboo Cocktail - Sherry and dry vermouth. Diamond Martini - A well-chilled Vodka Martini with just a touch of dry vermouth. Dirty Hornitini - 'Dirty' with a reposado tequila. Fabiola - Brandy with dry vermouth and Grand Marnier. Jean Harlow Cocktail - Light rum and sweet vermouth. San Francisco Cocktail - 'Perfect' with a sloe gin base and two bitters. Spanish Harlem - An anejo tequila and sweet vermouth. Once we get beyond the two ingredient martinis, we come across those that add a little extra flavor. Yet, they are no more difficult to mix up and require the same basic bartending skills and tools. Strictly a list of classic cocktails, most of these recipes follow the distilled spirit-vermouth model of the original Martini. They do add another layer of flavor via fruit juices or flavored liqueurs. You will notice that the classics often have a very simple style. Unlike many of the modern martinis that can use five or more ingredients, many of these require just three or four ingredients. It proves a point that sometimes simple is better. Among the long list of classic cocktails, a few recipes stand out as absolutely essential. If you are going to mix up one drink this evening, make it one of these. You will soon discover why they have been enjoyed for a century or more. Bronx - 'Perfect' gin martini with orange juice. Campari Cocktail - Quite simply vodka with Campari. Metropolitan - Brandy, sweet vermouth, syrup, and bitters. Park Avenue - 'Perfect' with gin and pineapple juice. Thanksgiving Cocktail - Gin, apricot brandy, dry vermouth, and lemon juice. Tuxedo - Gin and dry vermouth with maraschino and anise liqueurs. Waldorf - A sweet Manhattan with a hint of absinthe. If you are looking for even more flavor in true classic style, give some of these drinks a taste. They are ideal dinner drinks and perfect for those nights when you want to step away from traditional dry martinis. Fruit martinis are among the most popular recipes found in the modern cocktail scene. There are many possibilities and combinations that can be constructed using juices, fruit liqueurs, and infused spirits. 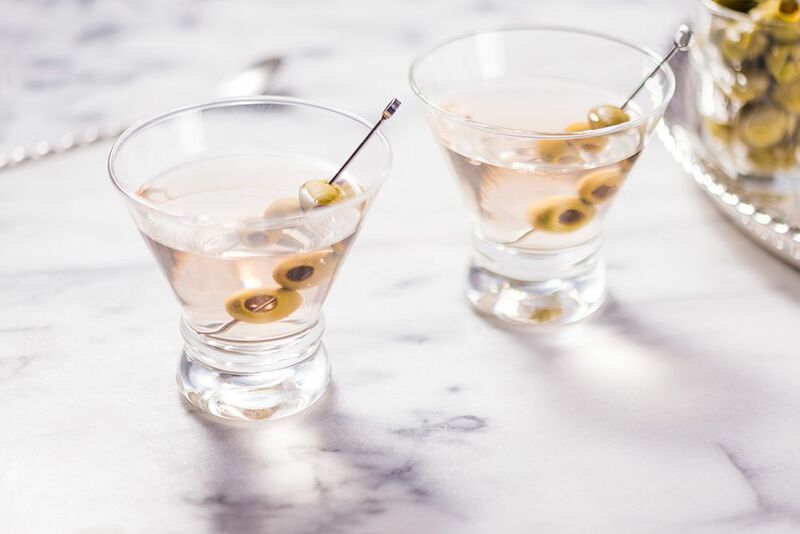 The majority of the fruitier martinis are modern recipes, though you will find a few classics that add just a touch of fruit to a liquor-vermouth base. Some of these drinks also rely more on juices than they do on liquor, so they can be a little softer. Don't let the sweet taste of a fruity cocktail fool you, though. Sweet fruits can often mask how much alcohol you think you're drinking and it is easy to cross the line and have one too many. There are a number of recipes that are just a little bit sweeter, a little bit tastier, and more popular than all the rest. Many of the best fruit martinis combine two or three fruits into a delicious fruit punch and that is why we love them so much. You can search far and wide and run into a thousand different ways to make an 'Appletini.' This small collection narrows down your options and it includes some of the best-tasting martinis to feature the taste of apple at it's finest. Raspberry is the most popular berry flavor for simple martini drinks and it often comes from a pour of Chambord liqueur. You will find that other berries, including blueberry and blackberry, can be used in combination with other fruits to create some amazing drinks as well. The Cosmo put the cranberry at the top of the martini menu and this is one of the best fruits to mix with. The drinks are sweet, easy, and a lot of fun to serve at any party. Simple and just slightly tart, the martini recipes that feature lemon and lime juices are among the cleanest tasting drinks you can mix up. The citrus is refreshing and the recipes are easy to mix up. Orange is one of the fruits that we use most often in the bar. Quite often it comes into play as orange juice, though you will find that many martinis use orange liqueurs as accents as well. Ah, the sweet peach! It does not make an appearance in many cocktail recipes, but when it does, the result is spectacular. It's a subtle fruit flavor and needs to be handled delicately or it will get lost in the mix. Yet, as you will quickly discover, pear martinis are absolutely delicious and you will definitely want to share these beauties. We have to have a few pineapple martinis, now don't we? You might think these are reserved for summer, yet these delicious recipes are too good to keep to a single season. Whether via a pomegranate liqueur like Pama, fresh pomegranate seeds, or the sweet juice, pomegranate is a great fruit for creating tasty martinis. It also pairs surprisingly well with other flavors and some might even consider it as the new cranberry. All of those other fruits are seen in countless cocktail recipes, but every now and then you get a taste for something that is completely different. That is where these fun little drinks come in. They are just exotic enough to take care of that craving for a new taste. Some martini recipes don't really fit into any other category, so it's best to feature them on their own. Don't discount any of these because they are definitely worth a taste. Who knows, your new favorite may be right here. There is a certain appeal to the sweet dessert-like martinis that is hard to resist. These are the martinis that can fix a craving for the sweet and decadent. Many are creamy or have been created to simulate the taste of a popular dessert or candy. Quite often, they are too delicious to be true. You will also find that there are a few ways to get the same flavor combinations. Mint-chocolate, coffee-cream, and chocolate-orange are some of the popular pairings that can be created using a variety of ingredients. If you find that you don't care for one recipe, try another with a similar profile. Eventually, you should find the recipe that is right for you and the journey is definitely not a painful experience. You're in luck if you when that craving for chocolate hits you because this is one of our favorite flavors in the bar. When it comes to sweet chocolate martinis, there is certainly no shortage of recipes to try and there's no reason you shouldn't get a taste of every one of them. Any flavor can be sweetened to create a dessert-worthy drink and this small collection of recipes takes us to the tropics and also gives us a bit of exotic flair. If you're looking for something new or an old favorite, it may just be right here. Fall and winter have their own style of sweets and any of these martini recipes will do just fine for satiating those cold-weather cravings. Add a little spice to your martini routine with these fiery cocktail recipes. This collection of includes the spiced and spicy martinis, essentially any drink that has a little kick behind it. Some, like the Habanero Martini, are blatantly spicy-hot, while others use a little ginger or cinnamon to accent the drink. A number of the recipes add spices to contrast cream or fruits, while others use a combination of spices to reimagine holiday desserts into liquid delights. Have fun with these, but remember that it is very easy to have too much spice. Take it easy. When it comes to spicy, few ingredients can bring it on better than hot peppers and wasabi. They may be few, but these martinis are among the best for drinkers who want to bring on the heat. Ginger is one of the best spices for cocktails and we use it all the time. If you want a break from the spicy heat of peppers, enjoy the spicy snap of a ginger martini. Some martinis are subtle in their spice yet they are certainly not boring. Enjoy one of these easy recipes next time you're in the mood for a martini that's just a little out of the norm. Herbs have long been used in drinks and some of the best martinis rely on fresh herbs or herbal liqueurs. One thing that these have in common is that they are some of the most refreshing 'up' cocktails that you will find. This collection of cocktail recipes lists some of the best martinis that feature herbs. From anise to lavender and some of those great, herbal spirits like Chartreuse, it's an interesting collection. Some herbs like elderflower, lavender, and rosemary have a sweet, flower-like taste and this is a fabulous accent for delicate cocktails. Perfect for spring and summer, these recipes may be subtle, but they certainly have a WOW factor. From the intense flavor of anise to herbal liqueurs, many herbal cocktails are packed with flavor. These recipes are among the most interesting and if you're seeking a drink your guests will talk about for weeks, look no further.